Roadway workers who were injured while on the job may have alternative options for financial recovery in addition to workers’ compensation benefits. So long as the responsible party is not the injured worker’s employer or a co-worker, he or she is entitled to file a third-party claim against any liable party. 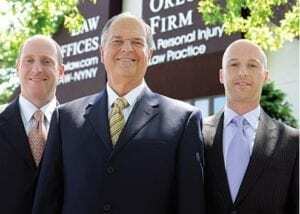 At The Orlow Firm, our injury attorneys have more than 120 years of combined experience handling construction accident and roadway worker injury cases in The Bronx, Queens, Manhattan, Brooklyn and all of New York City. Using our significant knowledge of the law, we are able to fight for a fair outcome in negotiations or at trial. You should expect the best from any personal injury law firm you hire. When you hire The Orlow Firm, you will speak directly with a partner. Contact us today so we can begin working for you. Call (646) 647-3398 or contact us online for a free consultation. Road construction can be dangerous for workers. Road construction sites are filled with moving vehicles, construction equipment and other hazards. Were you hit by a vehicle on the job site? Were you or a loved one crushed under road construction equipment? Did the safety parts on a machine you were working on fail? Did a subcontractor fail to provide you with proper safety equipment, resulting in a serious injury? If you have been injured in one of these ways or in some other job site accident, our attorneys may be able to help you. We can refer you to a qualified workers’ compensation lawyer, and we can evaluate your case to determine whether you have a potential third-party claim. Careful investigation of any accident resulting in an injury is important, but this is especially true when potential third-party claims are at stake. We will thoroughly examine the facts of your case, consulting with experts to determine the cause of the accident and the party at fault. Through our understanding of the facts, we can build a strong and compelling case that can help maximize your compensation. The experienced personal injury lawyers of The Orlow Firm are able to provide effective representation in third-party claims. If you are a roadway worker and were injured on the job, we can go to you if you cannot come to us. Call us today at (646) 647-3398 or contact us online for a free consultation to discuss your case and legal options.